After the 2nd oil crisis the old trend picked up at first but from 1990 onwards energy consumption and GHG emission seemed de-coupled, partly of the economic crisis in post-USSR countries that later joined the EU. While energy consumption kept growing, GHG emissions stabilized somewhat. From 2014 energy consumption is on the rise again, reflecting the economic growth. And, as Eurostat recently announced, also in 2017 energy consumption rose further. 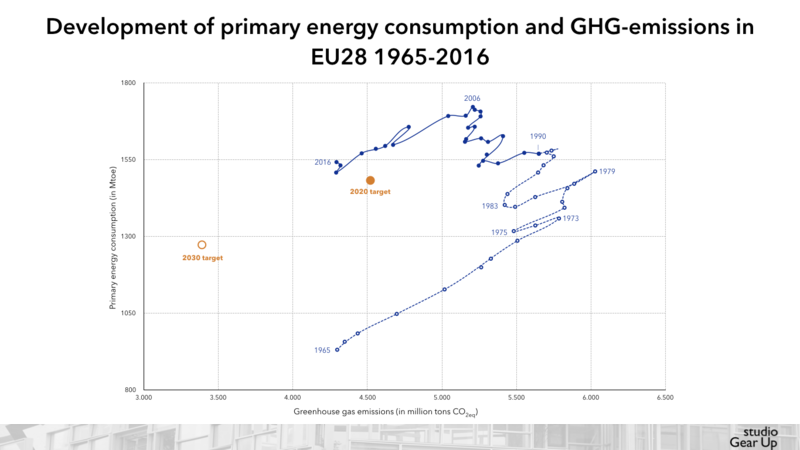 In the graph the EU targets for GHG emission reduction and the corresponding energy efficiency ambitions are presented for 2020 and 2030. EU is achieving its 2020 GHG emission target, but moves away from the energy efficiency target. The diagram makes it clear that the EU needs to curb its energy emissions to really get into the direction of the 2030 targets. For 2050 only for the GHG emission reduction targets numbers are given. emissions 90% below 1990-level would result in max 565 million tonnes CO2eq, far left outside of the diagram. Would it be possible to reach 1965-levels of primary energy consumption? It seems that that more or less would be needed in the road to 2050. It would require massive innovations on resource and innovation efficiency. And it would also require a clear strategy on avoiding as much as possible unnecessary energy consumption.